Two and a half years after release of the Plustek OpticFilm 7400 a follower by the name of OpticFilm 8100 was placed on the market in February 2012. With this the 7th series, which formerly started with an OpticFilm 7200, then was replaced by the OpticFilm 7300 and finally ended at the OpticFilm 7400, came to an end and one could mean, that with the 8th series an absolute new generation of Plustek film scanners came out on the market. In our shop the Plustek OpticFilm 8100 as well as matching film holders are immediately deliverable. Indeed however the 8th-series doesn't signalize the beginning of a new scanner-series but rather points to the utilization of the new SilverFast-Software at version 8 as scan-software, whereas the version 6 was delivered with the predecessor models. According to information of Plustek the hardware of the new OpticFilm 8100 doesn't differ from the predecessor OpticFilm 7400. Our following test review will show if the new SilverFast-Software only enables an alternative handling of the scanner or if also quality improvements or velocity increasing compared to the predecessor model can be obtained with it. Not only according to its technology but also on the face of it there is no difference between the Plustek OpticFilm 8100 and its predecessor Plustek OpticFilm 7400. Both devices are as alike as two peas in a pod. Solely the type label on the upper side of the scanner respectively the color of the scanner-casing reveals, that here it's a matter of the OpticFilm 8100. The cardboard box, which one gets after the purchase of the scanner, contains the whole package which one is used to know from Plustek: Besides the scanner in each case there is a filmholder for up to four framed 35mm dias and for a filmstrip with a length for up to six pictures, power adaptor, USB-cable, a bag for retention respectively transportation, user's manual and the software package in it. The latter consists of a CD with Plusteks rudimentary scansoftware QuickScan and the Presto! PageManager as well as another CD with the software SilverFast SE Plus 8 - the newest version of LaserSoft Imagings scan software by the time of the test review. 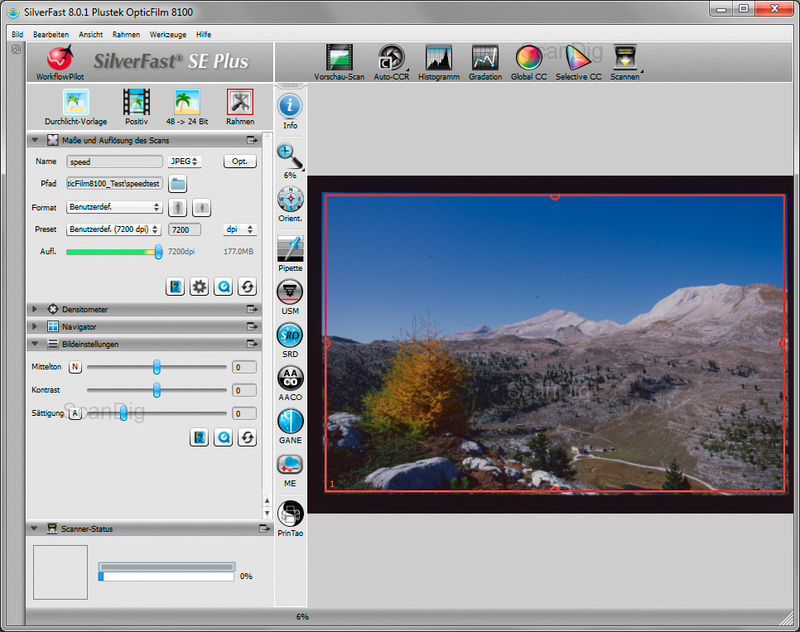 Whereas for the predecessor model still the SilverFast SE Plus Software at Version 6 was included, so for the OpticFilm 8100 the new version 8 is included in the delivery contents. The manufacturer's data also certify the OpticFilm 8100 as well as their predecessor a sensational optical resolution of 7200ppi. The scan of a 35mm-diapositive or -negativs at this resolution results in an image-file of 70 megapixels. Such an image at color depth of 24 bit has an uncompressed file size of about 210 MB! Further below in the chapter image quality we take a look at how it's about the effective obtainable resolution - but here we expect from our experience a rather sobering result. The manufacturers details of the optical resolution as a rule differ strongly from the effective resolution. The nominal resolution anyhow hasn't changed since the OpticFilm 7200. And if the nominal resolution of a scanner is much higher compared to the effective resolution then this is a big disadvantage for the digitizing of film material but more to this further below. As well as for the last OpticFilm-generation, too - the 7th series - the 8100 differs from his big brother Plustek OpticFilm 8200i in the feature, that he possesses a hardware based dust- and scratch correction. Unfortunately with this already a major shortcoming for the image quality is given: No matter how good one cleans his templates, one never will get them free from dust and the dust will always be more or less obvious visible in the scans, too. Such a correction method in our opinion has to be included to a good filmscanner, After all even cheaper devices from other manufacturers come up with this technology. Like for all Plustek OpticFilm-scanners so far, also for the OpticFilm 8100 the installation is going something different than one used to know from most USB-devices. Nevertheless the operation of the youngest sprout of the series doesn't confront even the most clueless user with problems: Instead of installing the software first und then connecting the device to the computer, for the OpticFilm 8100 one has to connect the scanner first and turn it on and only then, after prompting of the operating system, one has to install the software. For this one only has to follow the statements on the screen (choose "Automatical software installation"), and after a reboot of the system the scanner is operational. Now one could at once do the first scans using QuickScan. Because also the SilverFast-software is included in the delivery contents, one should of course install this one, too. This is going on easy alike and after entering the serial number stuck on the CD-case everything is done and one can get started. The manual, seeming to be delightful comprehensive at a first glance, unfortunately proves as a quick guide with assistance for the installation if you take a closer look. The big number of pages simply comes to an existence by the translation of this quick guide in altogether 13 languages. A more detailed manual is included on the CD as PDF-file. Unfortunately this one is mainly concerned with the QuickScan-software, an operating instruction for SilverFast is not available. As resort the specialist book SilverFast - the official book is recommended. But also without detailed user guide one gets going easily with SilverFast 8 thanks to the new control concept, and the first scans are dons quickly. To optimize the results, one should of course be concerned with the software a bit because it offers quite complex preference capabilities. The diapositive-holder included in the delivery contents of the Plustek OpticFilm 8100 can grab up to four framed 35mm diapositives. It correlates exactly the holder of the predecessor model and of course also the diapositive holder of his big brother OpticFilm 8200i. To put a diapositive in it, one simply has to insert it slanty from the upper side of one of the four slots, push it aside to the opposite of the spring tension, and flip it down. The diapositive then is fixed and can only get out by newly pressing against the spring and afterwards by up lifting. The only difficulty which can occur at this system is the danger of overturning of the spring power using the fingers at the diapositive frame, to slip and touch directly onto the film surface. If one for now has put in some diapositives, one gets a good feeling for the method and has no problems with the arming of the filmholder. Despite of it we recommend the wearing of cotton-gloves, to make sure, that one doesn't accidently destroys a diapositive at inserting our removing, because nothing is more annoying than inserting a diapositive in the filmholder and accidently leaving a marked fingerprint on the film surface and scanning this one in full size. The construction with the springs under a cover isn't made for taking in diapositive frames of more than 3mm size. However it's possible, but one should be clear about heavily loading the springs beyond all measures and so the danger of harming it is given. Anyway the springs are wearing parts, which at numerous usages quite well can go belly-up. 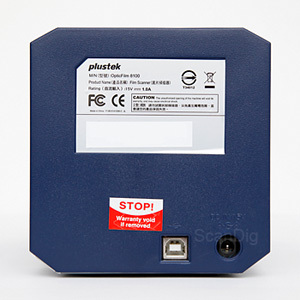 Because of it and because it's convenient to be able to already arm a second film holder while the first is still in the scanner, we recommend the purchase of another Plustek diapositive holder. So one already has a spare part at hand if someday a spring should fail. For a film scanner which operates with film holders and so the diapositives respectively the filmstrips are not directly inserted into the device, one could guess, that it possesses a film transport, which enables the automatically scanning of all templates containing in the holder at the push of a button. Unfortunately this also isn't so for the Plustek OpticFilm 8100 - a shortcoming, we would be glad about its removal already since the the first OpticFilm-generation. But an automatical film holder-tranksport would probably tremendously increase the price of the device, so that Plustek better bets on handcraft of the user. Apart from that also the big Plustek OpticFilm 8200i has no automatical film transport. The procedure of the scanning is as usual: Create a preview, alter preferences and perform the main scan. So up to four diapositives one can insert into the diaholder and after the first scanning one manually pushes the holder one picture further. This approach is quite time consuming. 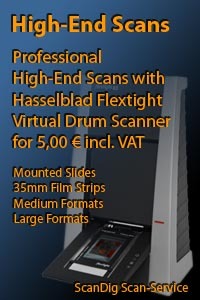 Filmscanners with a direct diapositive slot like for example the competitive model Reflecta CrystalScan 7200 are better suitable for the scanning of framed diapositives. The scanning of higher quantities of framed diapositives with the OpticFilm 8100 is rather inconvenient. Also the filmstrip holder of the OpticFilm 8100 is an old acquaintance and corresponds to the film holder of the predecessor model. Filmstrips at the length of up to six pictures respectively up to six loose single pictures can be inserted. To do this, one has to lift open the holder at the short side. Thereby one has to take care of not pulling off the shutter because it can't be turned at an angle of full 180°. It comes to an end at about 110° and one gets into the danger of moving the shutter further what of course unavoidably leads to breaking the hinges. Furthermore the shutter stands always in the way at inserting of the filmstrips. Unfortunately this shortcoming Plustek also hasn't removed in the until then newest generation of their OpticFilm-scanners. Both the lower and the upper part of the filmholder have picture jetties available which take care of the plan position of the filmmaterial. So at inserting of something one has to take care of the jetties of the holder to be congruent on the picture jetties of the filmstrips. So one simply inserts the film strip directly from above into the opened holder. Vertically the filmstrip will be held in position from six little fixations above and below the single pictures. Plain filmstrips can be aligned very simple and one can just flip shut the film holder. The matter will get more difficult if one uses curved or rolled film material. Then it can be a very tricky affair, to fix the fimstrip with one hand, so that it doesn't slip while one closes the holder with the other hand. The case gets even more complicated if one wants to insert several short film parts. While one can accomplish the inserting of a filmstrip carefully by hand, for the removal one needs a tweezer with rounded shovels because otherwise one touches the film too easily and so leaves his traces. The most secure way of digitizing a filmstrip is however if one wears cotton gloves at least at one hand. Then one can touch the filmstrip without remorse and doesn't leave fingerprints. The scanning with the filmstrip holder works exactly in the same way like with the diapositive holder: One pushes is sideways into the device until the desired picture lies before the sensor. Thereby little index notches at the lower side of the holder help to positioning it right, by letting it always snap in the right position. After performing a scan, one moves the filmstrip holder manually one position further and is able to digitize the next picture. To make the scanning a bit more convenient and to create the workflows some more effective, we recommend the purchase of a second filmstrip holder. This one can yet be armed while the first one is right now performing his duties in the scanner. Additionally one also here has a spare part straight away at hand if the not so stable seeming shutter construction yet fails someday. In summary one can register, that the scanning of negative strips with the Plustek OpticFilm 8100 merely is an elaborate matter. The inserting of a filmstrip in the filmstrip holder consumes a lot of time and because the scanner has no automatically filmstrip transport available, after every scan one has to position the negative holder anew to scan the next picture. A scanner with automatical filmstrip indentation is the Reflecta RPS 7200 Professional, which however also cost many times more than the Plustek OpticFilm 8100. 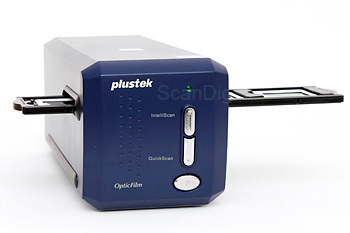 The software package of the Plustek OpticFilm 8100 contains everything one needs for scanning of his 35mm image-diapositives and 35mm image-filmstrips. Besides Plusteks simple scan software QuickScan, which allows you the digitizing of diapositives or negatives with minimal effort but also only with minmal preference options, on the Plustek-CD also the simple picture management program NewSoft Presto! PageManager exists, from which one also can scan and use other functions like e.g. the optical character recognition. The tools Presto! ImageFolio and Presto! 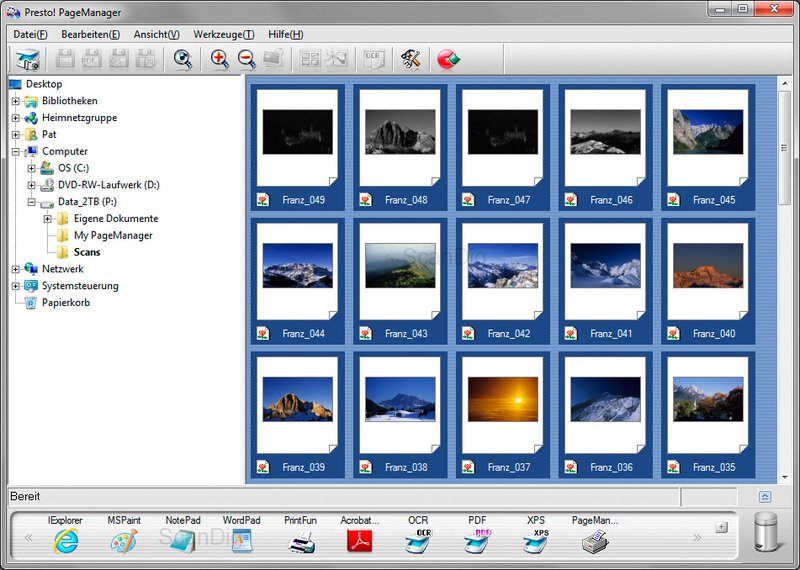 ImageExplorer which were included in the delivery contents of the previous model are now no more on the CD. But one can live with the lapse of these tools because the most important part of the software equipment of the OpticFilm 8100 is LaserSoft Imagings scansoftware SilverFast SE Plus in version 8. Thereby it is a matter of a version of the professional scansoftware SilverFast Ai Studio which has a reduced range of functions. The plus in the version labeling means, that this software is also able to handle multi-exposure-scans. At this technique thee template is sampled two times, in fact with different exposures to light. Then both scans will be automatically calculated to one image by the program. The result is an increased dynamic range, so that the digital image exhibits more drawing above all in the darker but also in the brighter image areas than a simple scan. You find detailed information about multi-exposure on our SilverFast FAQ-page. For the predecessor model Plustek OpticFilm 7400 the SilverFast-software was still in version 6 included. The jump to version 8 affects mainly the user interface of the software, in other words it became distinctly clearer, so that it is easier to learn and the scanner is easier to operate. What one also needs to work with the Plustek OpticFilm 8100 is an image processing program, because every picture should be reworked after the scanning even if only to remove the unnecessary doubled pixels so the image-file-size gets lower. For an image processing program for example Adobe® Photoshop® Elements in a version starting from 8 or alternatively the free freeware Gimp is recommended. As already said the Plustek OpticFilm 8100 doesn't differ from its predecessor OpticFilm 7400 in relation to its hardware whose image quality leaves much to be desired. Because of it we now want to look and want to know if the new scan software SilverFast 8 improves the image quality. The resolution of the scanner hasn't changed as expected - lastly still the same sensor like in the predecessor model is implemented. Still the "little" Plustek surpasses its big brother OpticFilm 8200i at over 500 ppi: The effectively recoverable resolution is at about 3800 ppi. That is only about 53% of the optical resolution announced by the manufacturer, but nevertheless 3800 ppi are a pleasing high value. Otherwise such resolution values are only reachable by distinctively higher priced scanners. You can read more about that about in our test review of the Plustek OpticFilm 7400. At this point it shall be mentioned that one has to scan at 7200 ppi to get the highest available effective resolution. One just can't directly scan with 3800 ppi because then the realized effective resolution is further decreased. So to keep the file-size preferably low one should scan using 7200 ppi and calculate the digital image afterwards down to 3800 ppi by using an image processing program. Also this is necessary because scans at 7200 dpi result in lower image-files of 210 megabyte, however in deed in the image-file are only about 60 Megabyte of information; the remaining 150 megabyte consist of double and three times pixels. The removal of these is the task of image processing programs after the scanning. More interesting is the question how it is about the density range of the scanner because here something could be changed. Does the new SilverFast-version get more out of lights and shadows than the old version? To find this out we are scanning a test diapositive with a high theme contrast and initially look at the drawing which is present in the dark image areas: Unfortunately here not much can be seen, which shows, that the new software unfortunately doesn't get any improvement on this point. The scans with the OpticFilm 8100 exhibit in the dark areas only very less drawing. Here other scanners in a similar price region offer a better performance. To make the comparison possible we also scanned the test diapositive with the Reflecta CrystalScan 7200 and the professional scanner Nikon Super Coolscan 5000 ED. 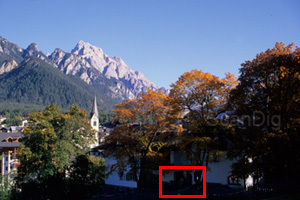 Click on the thumbnail to open an image window with the upper red marked image clipping that switches about all three seconds between the three scans. 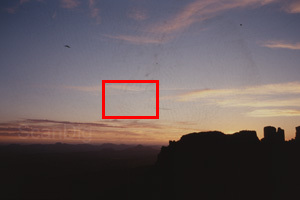 As one can easily recognize, the scans of the CrystalScan exhibit more drawing in the shadows - here still details are realized which are barely or not visible at the OpticFilm 8100. Here the Plustek-scanner unfortunately provides merely sobering results; the contours of a picket fence are barely visible. Like expected however best possible results realizes the Nikon-device but whose price lies many times higher. For the tracing of the lights the result is similar: Very bright image areas quickly break out on the OpticFilm-scans, that means they barely exhibit drawing. This is shown for a detail clipping in the area of a rock wall of the mountain: While good film scanner nearly still show every rock furrow, for the Plustek OpticFilm 8100 the rock wall mutates to a nearly uniform, flat surface in relation to its color. So here are no improvements at all compared to the predecessor model. But the missing hardware based dust- and scratch correction of the OpticFilm 8100 is the biggest shortcoming in the matter of image quality. Because one never gets his templates free from dust an elaborate image retouch afterwards using an image processing program is unavoidable for good image results. For this for example Adobe® Photoshop® Elements in a version starting from number 8 (higher versions differ only marginally) or the freeware Gimp is recommended. To show you how important this function is we digitized an not cleaned diapositive once with the reflecta CrystalScan 7200 using the activated dust- and scratch correction and once with the Plustek OpticFilm 8100. Here too a click on the thumbnail opens an image window with the upper red marked image clipping, that switches about every three seconds between both scans. As you see, there is quite a big difference if the scan is clean or one can distinctively see every dust grain. You can read more about the topic hardware based dust- and scratch correction on our page about correction methods. So with the newest SilverFast-software the image quality of the Plustek OpticFilm 8100 hasn't changed. Still the scans exhibit a relatively low density range. Also of course new software can't alter the missing hardware based dust- and scratch correction. In principle also an improvement of the image quality through the new SilverFast scansoftware wasn't expected because SilverFast distinguishes itself all along by very good image processing algorithms. These are also included in the version 8 of the scansoftware. Crucially changed has the user interface of the software but these of course don't influence the image quality of a scanners. If the image quality still hasn't changed, also the new SilverFast scansoftware influences the scanning time very little? Lastly it yet is a trademark of the Version 8 from Lasersoft Imagings new scansoftware, that the software was adapted to modern computer-processor-architectures. The following table shows the scanning times for different resolutions each with and without multiexposure. For the determination of the times we have connected the Scanner via USB 2.0 to a 64-Bit-System with an Intel Core i3 2.1 GHz processor and 4GB ram. Surprisingly the OpticFilm 8100 is slower than his predecessor OpticFilm 7400. The latter needed short of 3 minutes for a simple scan at full resolution while the same scan with the 8100 only took short of 4 minutes. We can't explain how this loss of velocity is achieved; particularly we used a much faster computer for the determination of the results for the new OpticFilm 8100 than for the test of the OpticFilm 7400. If one activates the multiexposure-function the scanner needs more than double of the time which the corresponding simple scan took. So if one wants to digitize bigger diapositives- or negative archives, this is a very time consuming matter using the Plustek OpticFilm 8100. Above all because one will work with the highest possible resolution for archiving purposes. Because one should calculate the 7200-ppi-scan down to the effective resolution of 3800 ppi afterwards, not having to handle with unnecessary oversized files, this processing time has to be added to it. Delightful is that the scanning times for negatives only take marginally longer, than the ones for diapositives so we don't list them separately. Most scanners need noticeable more time for negatives than for diapositives - so here the OpticFilm 8100 is a laudable exception. In summary it can be said, that the Plustek OpticFilm 8100 is a quite slow scanner. For a high resolution scan one has to reckon with short of 10 minutes. The one who wants to digitize a big archive has to arrange month or even years for it. The new SilverFast Scansoftware in version 8 unfortunately can't contribute to a velocity increase. But this too one can't really expect because for a scanner without dust- and scratch correction the software respectively the PC has to calculate very little. For the most part the scan duration is achieved because of the scan process and the data transfer. The new SilverFast version 8 unfortunately doesn't produce any improvements at all for the Plustek OpticFilm 8100 in the matter of image quality compared to the predecessor model OpticFilm 7400. Delightful is the high effective resolution of 3800 ppi. Unfortunately nothing has changed in the matter of density range and the scans of the OpticFilm 8100 exhibit less drawing in lights and shadows than scans of comparable devices from other manufacturers. In our shop the Plustek OpticFilm 8100 as well as matching filmholders are immediately deliverables. The biggest shortcoming of the "little" scanner from the OpticFilm-series is and will always be the missing hardware based dust- and scratch correction. A device without this feature isn't contemporary anymore and therefore not recommendable. But finally the OpticFilm 8100 has to differ anyhow from its big brother, the OpticFilm 8200i. In the matter of hardware the integrated iSRD-function of the OpticFilm 8200i is the only difference between both devices. 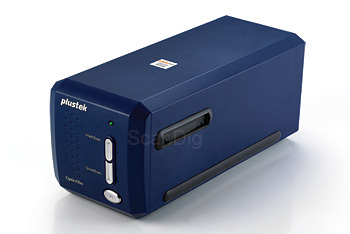 So we can't give a recommendation for the Plustek OpticFilm 8100 because other scanners of the same class like e.g. the Reflecta CrystalScan 7200 bring both a higher density range and - this enormously carries weight - an infrared-technology for the automatical dust- and scratch correction with them.